Forrest Gump is one of my favorite movies of all time. The movie teaches about humility, perseverance and the importance of values. However, it also teaches one very important thing: you could be a multi-millionaire, but you’re better off riding a lawnmower anyway! Riding a lawnmower is one of the great pleasures of life; the fresh air filling your lungs while you get some work done, all the while beautifying your yard. As this job is so important, it’s essential to have the right mower, and the one I’m featuring today is one of the best on the market. And today I’ll take you on a ride on the Craftsman T225 mower, so let’s get started with the features! 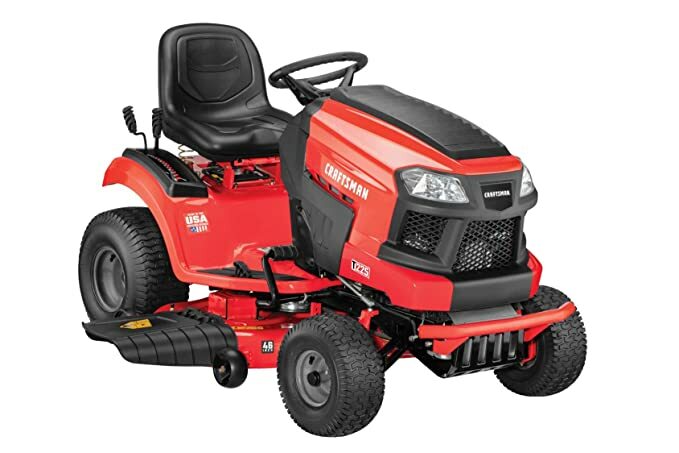 Craftsman Lawn Tractor Reviews 2019: What I liked about the T225? 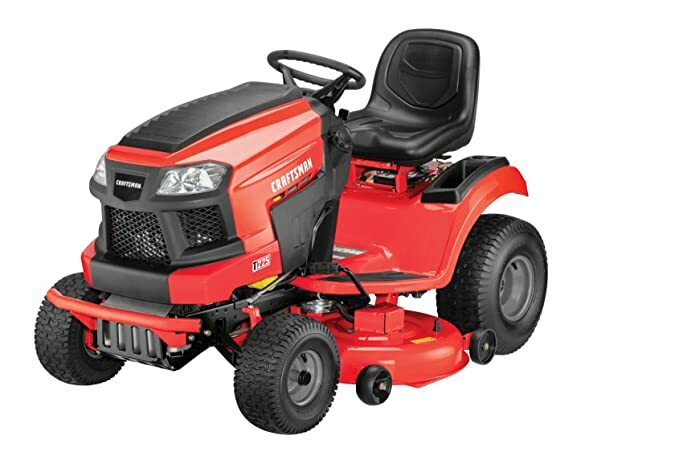 The Craftsman T225 features a Briggs and Stratton gas engine producing 19 horsepower. This makes it one of the most powerful mowers in its class. The engine ensures that the mower will never get stuck, no matter how tough the task. Craftsman and Briggs and Stratton know what a struggle starting your mower with a pull-cord on those chilly winter mornings is, and so they’ve equipped T225 with ready-start to ensure that it purrs right up every morning! T225 features one of the most comfortable seats of any mower I’ve come across. The seat features a backrest to protect your back from bumps and undulations and also to give you a place to set your back. Moreover, the seat is cushioned and adjustable, unlike some other mowers I’ve seen. The benefits of a cushioned and adjustable seat become apparent over protracted jobs, and your back will thank you for it. 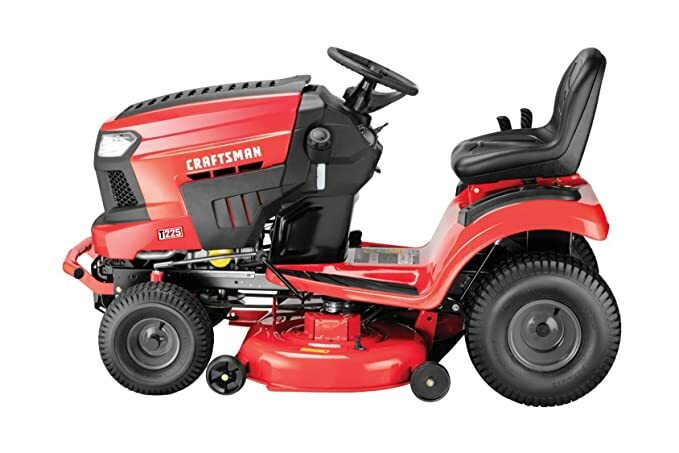 The Craftsman T225 is capable of cutting across 46 inches of grass in a single sweep, making its sweep area one of the widest in its class. It also features a deck wash, which means that once you’re done with the cutting and mowing, you don’t have to fiddle with the deck and get your hands dirty to clean it; just let T225 handle it! It also features “mow in reverse” which means that if you find your mower’s nose pointing the wrong way, you don’t need to bother yourself getting it pointing the right way as the mower can even mow your lawn while going backward. As important as a mower’s engine and cutting mechanisms are, it’s the oily bits which support them and keep them running at the end of the day. Craftsman T225 comes with a hydrostatic foot-pedal transmission. You may skip this bit if you’re not mechanically inclined, but basically a hydrostatic transmission utilizes a hydraulic pump to displace fluid at varying rates, and this displacement makes the drive gear move accordingly. The best part about a hydrostatic transmission is the fact that it requires no maintenance whatsoever. There are virtually no moving parts in the transmission, and you probably won’t encounter any fluid leaks during your time with T225 as the mechanism is sealed. The front axle is made of cast iron, which is stronger and more resistant to corrosion than steel. Although you can mow your lawn in reverse (as discussed previously), T225 also features Turn Tight technology, which gives it an impressive turning radius of 6 inches. Lastly, T225 has excellent ground clearance thanks to its 15 inches front wheels and 20 inches rear wheels. This means that it is unlikely to get stuck on bumps and mounds and will clear them with ease. Let’s be realistic here; a mower isn’t designed to set lap records on a racetrack; a Porsche is designed to do that. A mower is designed to mow lawns, and lawns are much rougher than racetracks. That’s why it’s a good thing that T225 has excellent build quality. I found the panels to be very sturdy and made well. The same goes for the controls; they’re screwed on tight and are unlikely to break even in the long run. Yes, T225 comes with a pair of headlights to help you mow your lawn at night or before the break of dawn, but frankly, I wouldn’t recommend doing so. That’s because the headlights do little to illuminate your lawn. They’re shaped strangely, and the bulbs themselves aren’t very bright, meaning that whatever little light there is, it’s thrown way off. Yes, this mower comes with a cup holder for your beverage! A novel feature, and one I wish Craftsman hadn’t bothered with. Mowing your lawn isn’t exactly the smoothest chore, and some of those vibrations make it to the mower and, consequently, the cupholder. This means that your drink will either spill or shake around so much that it’ll lose its heat. Mowing your lawn is a tedious chore, especially if you’re doing it manually. The march of technology has given us motorized lawn mowers, but the market is saturated with tons of them. The Craftsman T225 is part of the cream of the crop and is one of the best mowers on the market today. It has a powerful engine, a reliable drivetrain, and excellent mowing capabilities and I recommend buying it.